Dental museums are few and far between. Merely a handful of dental schools and private organizations devote resources to preserving our toothy beginnings. And yet dental products, remedies, and prosthetics have been around for hundreds of years. 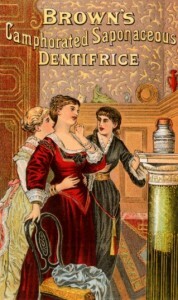 In a fascinating exploration of dentistry and advertisements, the University of Michigan’s Sindecuse Museum of Dentistry currently displays vintage print ads for everything from pink toothpastes to powdered-glass dentifrice! Explore the collection of 22 vintage images on their Flickr page or the Sindecuse Museum’s website. Next Next post: Is Your Retainer Retaining More Than Your Teeth?